Cheetah Hunt is steel roller coaster, located near the front of the park in Edge of Africa. The custom design roller coaster from Intamin features three launches with speeds up to 60 miles per hour, and is the longest coaster in the park’s collection. Cheetah Hunt is located in the Edge of Africa section of the park, and its entrance faces the courtyard opposite the Serengeti Overlook Restaurant. Cheetah Hunt was manufactured by Intamin, and purchased through Intaride LLC, the company’s exclusive U.S. supplier. It is a Linear Synchronous Motor (LSM) Launch Coaster featuring three separate launches. The first launch out of the station is 30 mph, the second leading up to the tower is 60 mph, and the third late in the coaster’s course is 40 mph. The tallest spot on the roller coaster stands at 102 feet above ground; with the aid of a trench, the largest drop is 130 feet. Along its 4,429 feet of track, Cheetah Hunt reaches a maximum force of 4 Gs, and features several overbanked turns, airtime parabolas, and one heartline roll inversion. Cheetah Hunt has a theoretical capacity of 1,370 guests per hour using five trains with sixteen passengers in each. Total ride time, including loading and unloading, is approximately three and a half minutes. The coaster has a minimum height requirement of 48 inches. In February 2010, survey markers began popping up for what was referred to as Project 2011, including a number that were visible to guests along the Skyride path. In March 2010, a cheetah topiary frame was placed near the former Clydesdale paddock. Construction was underway by April of that year, with preliminary site work including the realignment of Serengeti Express. By mid-June 2010, the Skyride was closed, a new temporary pathway around what would be come Cheetah Run was open, and work on trenches and footers was well underway. A multi-phase teaser campaign began in park and online on June 26, 2010, saying the new attraction was scheduled to open in Spring 2011. In the first part of the teaser campaign, QR codes were added to the construction walls around the site that directed to the website with short video clips highlighting the attributes of the new project, including Power, Speed, Spirit, Chase, Accelerate, and Agility. The second phase, in August, featured video messages from park officials giving hints about the theme and scope of the project. 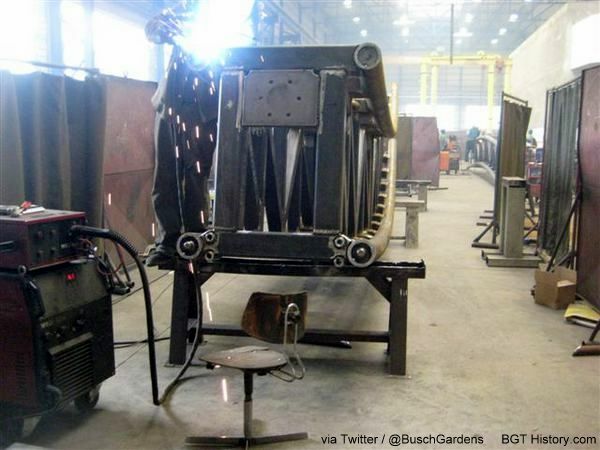 On September 10, the park released an image through their twitter account showing a section of roller coaster track being manufactured (seen below). Starting September 16, 2010, the third phase of the teaser campaign began where guests could enter code words on the site to unlock a glimpse on what the new attraction would look like. It was on that date the park also shared the official announcement would come in mid-October. On September 18, 2010, the first track pieces arrived in the storage lot north of Adventure Island. About 10 days later, the track supports were also on site in the storage lot. This one-of-a-kind, multiple launch-point coaster will board in Busch Gardens’ historic monorail station, which has been completely renovated as part of the new attraction. The first launch propels the train out of the station and into the grasslands that surround the new area. Moments later, a second burst of speed accelerates riders to 60 mph and up into the ride’s signature tower element that climbs more than 10 stories above the African landscape before plunging 130 feet into a subterranean trench. Cheetah Hunt covers a lot of ground, setting a new distance record for Busch Gardens’ roller coasters at 4,429 feet of track. After leaving the Crown Colony Plaza area, it races across a portion of the Serengeti Plain, staying close to the ground to give guests the experience of a cheetah sprinting across the plains. Elements such as over-banked turns, air-time parabolas and a heart line roll inversion imitate the agile creature chasing its prey, leaping and pouncing into the Nairobi area, where the train twists through a rocky gorge that was formerly part of Rhino Rally. At the far end of this three-quarter-mile path, a third burst of speed rockets the train back across the plain toward the station in a thrill-ride experience unlike anything Busch Gardens’ guests have ever experienced. Along with being the longest roller coaster at the park, it also became the first triple launch coaster in Florida. By mid-November, vertical construction started with supports and track pieces appearing along the brake run and into the maintenance bay. Construction of supports and track was next concentrated at the beginning of the coaster’s course, through the first turn and towards the tower. By the middle of December, the tower was complete up to the point of the large drop into the trench. Track work then moved to the former Rhino Rally canyon in the days leading up to Christmas 2010. By the third week of January 2011, most of the track work away from guest areas was completed, including the heartline roll. Several online media outlets were invited for a special “blogger” hard hat tour on February 18, 2011. Mark Rose, Vice President of Design and Engineering, led the tour around the Cheetah Hunt site around the station and main tower. As part of the media event, it was announced the grand opening date for Cheetah Hunt would be May 27, 2011. Near the end of February, the cars for Cheetah Hunt’s train arrived at the park. Upon arrival, the park put out a short video showing the cars getting unloaded. The graphics with a cheetah theme were installed later. A major milestone was reached on March 14, when the final track piece was installed. Crews worked into the evening, bolting the section over the Skyride cables around 9:30 p.m.
Ride envelope testing began on March 22. The process involved towing a two car train using cranes and pulleys along the entire ride course. It ensured a smooth ride along the track and enough clearance above and on each side of the train when traveling accounting for a rider’s extended arms. The process would take several days to complete. Testing was scheduled to begin on Saturday, April 16, 2011 according to a press release. Each of the three launches was to be tested separately starting with the launch out of the station, then up the tower, and finally in the canyon. Once crews were satisfied with all three launches working separately, full circuit tests began, and included empty trains and ones with water-filled test dummies. Only after some 3,000 test runs would people be allowed on, and that first run would include Mark Rose. By early May, Cheetah Hunt merchandise became available for sale, with a section in Emporium displaying shirts, hats, and other items. On Monday, May 16, 2011, Park President Jim Dean along with the park’s Vice President of Marketing, Gerard Hoeppner, took their first ride on the new roller coaster. After the ride, Dean is quoted as saying “We have another winner here.” Also in mid-May, two contests were run through the park’s blog, each challenging readers to leave a comment with a specific task in order to win. The prize for 25 winners in each contest was a pair of passes to an exclusive after hours event on opening day from 8 p.m. to midnight. Media day was held on May 26, 2011, with a number of outlets getting a chance to ride before the general public. A VIP party for invited guests was held that evening. At ten Tampa area McDonald’s locations, customers were treated to a “sweet surprise” from 2 to 4 p.m. to celebrate the opening of the new roller coaster. 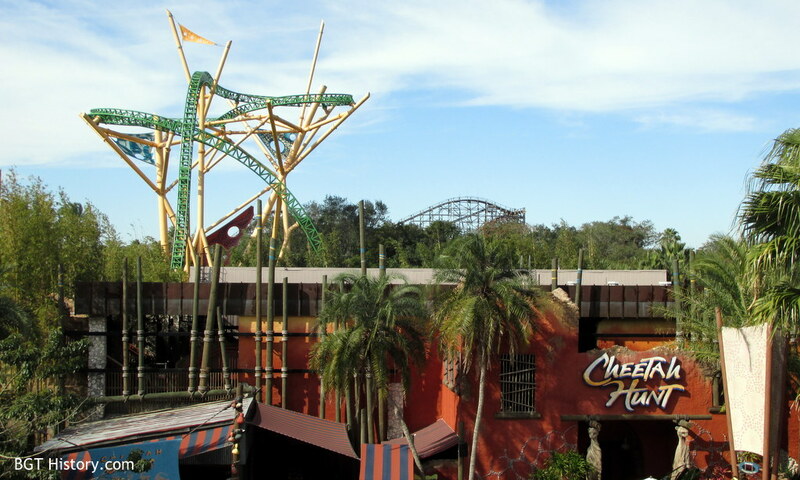 Cheetah Hunt officially opened on May 27, 2011. While it was scheduled to open with the park at 9:30 a.m. that morning, technical delays kept guests from riding until approximately 2 p.m. The park blamed faulty sensors as the reason for the delay. Opening festivities included a special performance by the park’s belly dancer troupe. Along with the park’s contest winners for exclusive ride time that evening, several radio station contest winners were also part of the special event on opening night. Saturday, June 4, 2011 saw a special event in the plaza in front of Cheetah Hunt – the Snyder’s of Hanover Pretzel Coaster Build-Off. The event featured six finalists from as far away as Ohio were chosen from online submissions showing off a roller coaster built entirely of pretzels. Beginning at 9:30 a.m. on that Saturday, finalists had three hours to build a recreation of Cheetah Hunt, entirely out of Snyder’s of Hanover pretzels and hot glue. Park guests could stop by and see the progress, and winners were announced at 1 p.m.
First place went to Stephen Boyd and his son Jesse from Plantation, Florida. They received a VIP visit to SeaWorld Orlando as their prize. Second place went to Ryan Brautigam of Lutz, Florida. The People’s Choice award, voted on by park guests, went to Freddie Knorr of Pinkerton, Ohio. Judges for the competition were Jeff Hornick, Busch Gardens Director of Design and Engineering; Chris Kraftchick, American Coaster Enthusiast Regional Representative; and Bob Gould, Snyder’s of Hanover Marketing Manager. Guests who visited the park on May 30, 2013 were able to vote for Cheetah Hunt for an episode of Travel Channel’s Insane Coaster Wars at a booth set up at the entrance of the roller coaster. 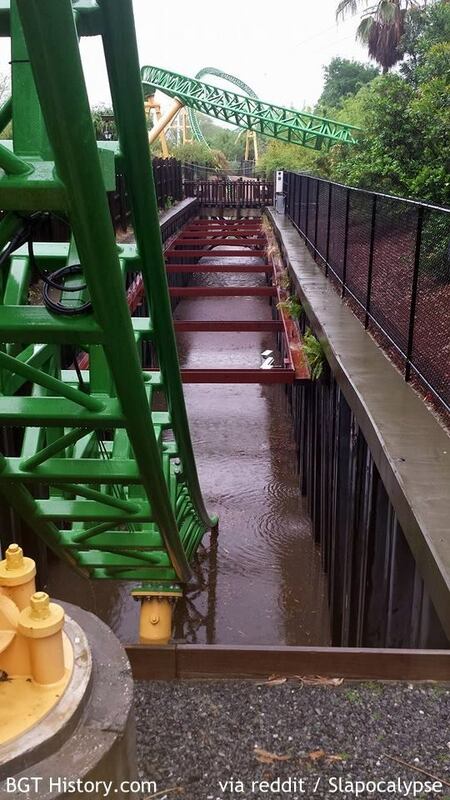 On May 2nd, 2014, heavy rains at the park flooded at least one of the trenches along the ride path. The image below, posted to reddit, shows just how deep the water was at one point. Cheetah Hunt had a delayed opening the following day, but was able to return to regular operation. Cheetah Hunt was featured in an episode in the third season Insane Coaster Wars on Travel Channel, which first aired on July 6, 2014. The roller coaster was originally part of the Cheetah Hunt area when it opened, which included the coaster, Skyride, Cheetah Run, Cheetah Snacks and Cheetah Gifts until the end of 2016. At the beginning of 2017, the updated maps handed out at the park showed the area merged with Edge of Africa. Additional details and images on Cheetah Hunt will be added in the future.